NETWORK FINALS: The SVU rerun lost 0.1 in final numbers. CABLE HIGHLIGHTS: A&E’s LIVE PD again ruled Saturday cable, down 0.03 to 0.63. Nickelodeon’s NICKY, RICKY, DICKY & DAWN jumped two-tenths to 0.42 (there was presumably a reason for that), pushing lead-out SCHOOL OF ROCK up 0.14 to 0.31, and then DUDE PERFECT SHOW up 0.08 to 0.28. Adult Swim’s late-night slate fared as follows: DRAGON BALL Z up 0.06 to 0.39 (the primetime episode was up 0.03 to 0.31), JOJO’S BIZARRE ADVENTURE up 0.06 to 0.34, TOKYO GHOUL up 0.07 to 0.32, LUPIN THE 3RD up 0.03 to 0.24, HUNTER X HUNTER up 0.08 to 0.29/574K, NARUTO up 0.06 to 0.26/453K, GHOST IN THE SHELL down 0.01 to 0.18/386K, ATTACK ON TITAN at 0.19/403K, and SAMURAI JACK steady at 0.17/363K. ESPN’s BOXING was at 0.32, preceded by its coverage of the NFL HALL OF FAME INDUCTION CEREMONY at 0.21 (the latter was also on NFL Network at 0.15). Fox Sports 1’s UFC FIGHT NIGHT was at 0.31. On HGTV, HOUSE HUNTERS RENOVATION rose 0.03 to 0.28, HOUSE HUNTERS was at 0.28, and BEACHFRONT BARGAIN HUNTERS was up 0.03 to 0.26. Food Network’s KITCHEN AT FN was at 0.28. HBO’s GEORGE LOPEZ special was at 0.26. Hallmark’s original movie LOVE AT THE SHORE was at 0.24. ID’s SON OF SAM special was at 0.22. On Spike, COPS rebounded by 0.04 to 0.21, and GONE was at 0.13. AMC’s TURN ticked down to 0.12. 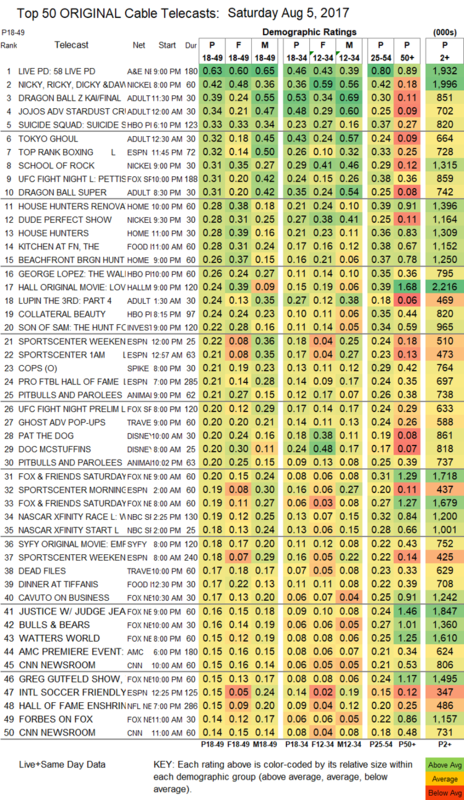 On OWN, 3 episodes of LOVE THY NEIGHBOR were at 0.11/0.11/0.09, compared to last week’s 0.12/0.11/0.11. BBCAMERICA’s ORPHAN BLACK fell 0.02 to 0.08.